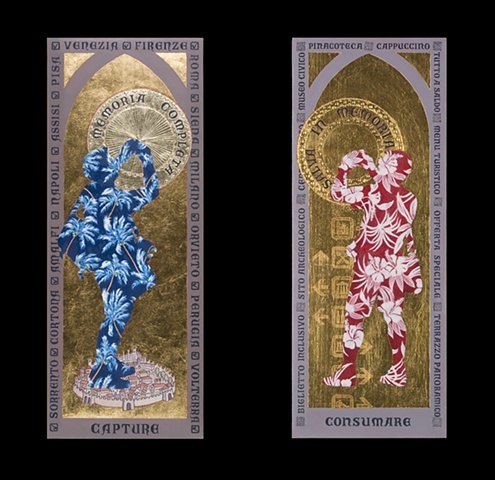 This pair of paintings uses the repertoire of medieval and renaissance panel painting to address issues associated with contemporary mass tourism. The two anonymous figures refer to not only the ubiquitous presence of tourists in Italy, but the tenuous co-existence between visitors and the art treasures of so many Italian cities. The panels recognize the initiative and inquisitive spirit of travelers, but also comment on the culture of acquisition and consumption (in many senses of the word) associated with cultural tourism.